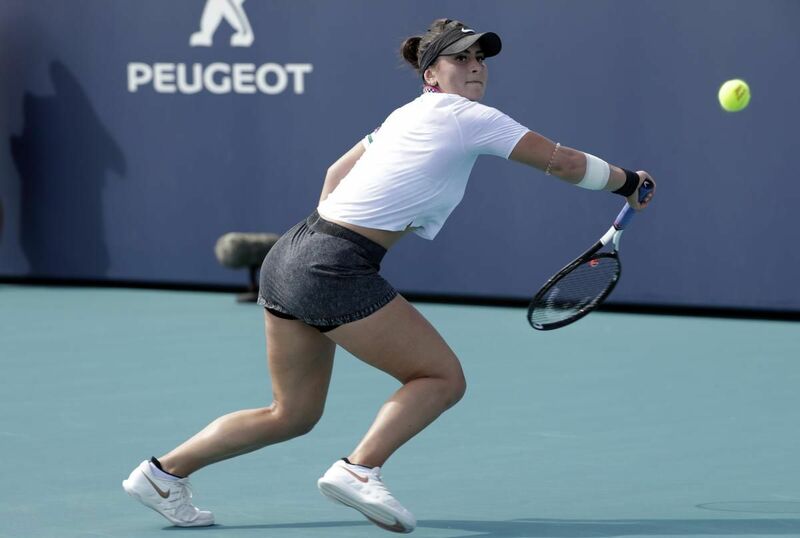 MIAMI—Everything was completely different for Mississauga’s Bianca Andreescu at the Miami Open on Thursday compared to her victory in the final of the BNP Paribas Open on Sunday in Indian Wells, Calif. Except for one thing: the 18-year-old’s fight and determination. Andreescu was nearly out in the first round at the hands of Irina-Camelia Begu on Thursday, in a match postponed from the night before because of rain. The Canadian teenager was down a set, and down 5-1 in the second set before pulling out a 4-6, 7-6 (2), 6-2 victory that puts her in the second round against No. 32 seed Sofia Kenin of the U.S. There won’t be much time to rest as that match will be played Friday afternoon. Even the cheering section was different. Andreescu’s parents, Nicu and Maria (and dog Coco) were on hand, having already arrived in Miami as their teenaged daughter was winning the title in California. And Andreescu’s game, usually full of variety, wasn’t working. Bruneau told her to mix it up more. He told her she wasn’t far away. After that consultation Andreescu got a second wind just as her opponent got tight. “He obviously helped me, as he always does. I fought as hard as I could, and I’m really proud of myself with how I dealt with everything,” Andreescu said. It turns out she had enough in the tank, after 21/2 hours, to do even better than that. She broke Begu’s serve a second time for safety, and closed it out. Also on Thursday afternoon, Andreescu’s fellow 18-year-old Canadian Félix Auger-Aliassime advanced to the second round with a 3-6, 6-1, 6-2 victory over Norwegian qualifier Christian Ruud.